• Girls Week. But regular session for boys also! Note: If we are full and you have no other options that work for you, we can put you on a Wait List in hopes that a spot will open up. Otherwise please select another session that is still open soon! Sessions 1, 3 and 4 are 9 day camps including 6 days skiing, 1 rest day off snow with loads of activities, 2 travel days. 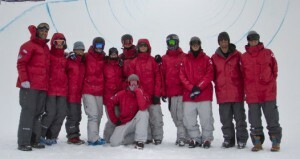 Sessions 2 and 5 are 8 day camps including 6 days skiing, 2 travel days. * Prices are charged in Canadian Dollars. US dollar rates are substantially lower now due to favorable exchange rate (see above) but will fluctuate daily and will depend on the final rate charged by your credit card company. We charge a $400 deposit at time of booking with the balance due 3 weeks prior to camp start. Payment can be taken earlier or payment plans can be arranged. ** Late bookings may be subject to additional charges once transfer and hotel bookings have been finalized. Please add 5% GST CDN tax to above prices. ***Session 1 pricing is based on 2 adults sharing a room with king bed and queen sofa. Upgrade to private room optional, space permitting. Contact us for details. Sessions 2-5 Full Package prices are based on 4 youth sharing 2 level, 4 bed loft rooms at the Blackcomb Lodge & Spa, based in the centre of Whistler Village. Upgrade to 2 bed rooms available. Adults attending these sessions will be required to upgrade to a private room if there are no suitable roommates of a similar age to share with. A Parent attending with 1 child will also be required to upgrade to a private room. • All afternoon and day off activities, water-ramping and trampoline. • Camp T-Shirt, Welcome Bag, plus many prizes from our Sponsors. • Package also includes video review, personal footage of your skiing and evening trampoline when available. You can schedule a private photo shoot ($100 Cdn + gst) with our professional Camp Photographer to ensure you get a great selection of action and if needed portrait shots. Full Camp – Enjoy all the benefits/logistical support of a Full Package Camp for a discounted rate. Bring a team of 5-9 people and receive a $100 pp discount, bring 10 – 14 people and receive a $200 pp discount. Your coach can accompany the group and pay cost only, as well as benefitting as a ‘shadow coach’ and learning from the top pros. Contact us for details. TEAM COMBINED CAMP – This camp is designed for teams that have experienced coaches and want their athletes to benefit from Momentums Coaches as well. Athletes will receive 3 days coaching from Momentum and 3 days coaching with your team coaches. All camp logistics taken care of by Momentum! Includes a full week of terrain access, coaching, lifts, accommodation, meals, activities, prizes and fun times! TERRAIN ACCESS ONLY This option is designed for teams with their own qualified coaches (Ski or Snowboard), looking to use Momentum’s exclusive terrain park and mogul lanes only. Terrain Access is awarded on a case by case basis. Please contact us for details and pricing. No logistical support provided. We accept Visa, Mastercard. Note that credit cards are charged in Cdn $ and are subject to the current exchange rates used by your credit card company. A $400 deposit per session is required to secure your spot and the balance is charged 3 weeks prior to camp start, unless alternative arrangements have been made. Canadians can also pay by e-transfer to info@momentumcamps.com. AMERICANS – REMEMBER TO GET A PASSPORT!!!! All Americans and other Internationals require a passport to fly to and from Canada. Please apply for a passport as soon as possible if you do not yet have one and check that current passports have not expired! • ‘BRING A BUDDY’ REFERRAL DISCOUNT – Bring a friend to camp with you, who has never been before and you will receive a $100 rebate off your own camp. Bring 5 new friends and receive a $500 discount… Unlimited! • FREQUENT FLYER – $50 discount per session if you sign up for 2 or more sessions. You can buy Momentum Birthday or Christmas Gift Certificates for camp or merchandise for any amount. Contact us for details at info@momentumcamps.com. Visit out Shop for merchandise sales. If you want to combine a Momentum camp with learning English, click here for information on IH’s Whistler programs. Momentum is offering discounted camp sessions for students this summer. • Cost – $175/session + GST. • If you purchase our Cancellation Insurance at the time of registration and you need to cancel for any reason, you will be reimbursed all your money back minus the cost of the insurance. This applies up until the day before your camp session starts. For this to be valid you must receive an email from us acknowledging receipt of your cancellation. • If you are injured during the camp and must return home, you will be reimbursed $200/day for each ski day missed after you leave the camp. Note that this insurance must be purchased at time of booking, using our on-line registration form. All participants must have adequate Accident and Medical Insurance in place for all camp activities, which must include Medical Treatment including Hospitalization, Ambulance, Helicopter Evacuation, and Return to Home Residence. Canadians please check with your health care provider what coverage you have when visiting BC.